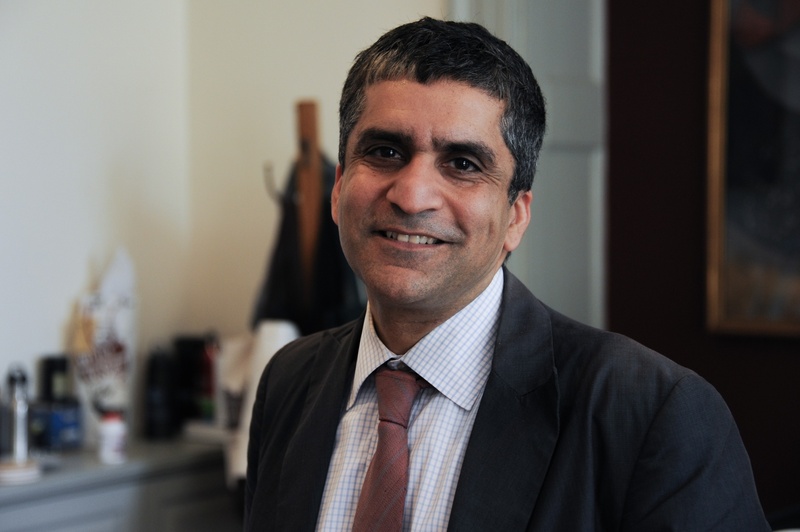 Forty-two percent of graduating seniors said they had a favorable view of Dean of the College Rakesh Khurana. UPDATED: May 24, 2017 at 1:54 p.m.
Forty-two percent of surveyed members of the Class of 2017 reported having a favorable view of Dean of the College Rakesh Khurana in a survey conducted by The Crimson, marking a significant drop from previous years and his lowest rating since assuming the deanship in 2014. Khurana’s decline in popularity appears to be tied to steps he undertook in the past year to pressure Harvard’s single-gender final clubs and Greek organizations to adopt gender-neutral membership practices. In previous years, Khurana’s favorability rating was significantly higher: 62 percent of surveyed seniors from the Class of 2016 said they had a favorable view of Khurana, while 82 percent of senior respondents said they viewed Khurana favorably in 2015. This year’s iteration of The Crimson’s senior survey garnered 790 responses, representing nearly half the graduating class, though not all respondents answered every question. In an interview Friday, Khurana said he was saddened to hear of his decline in popularity. In May 2016, University President Drew G. Faust announced a policy barring members of unrecognized single-gender social groups from holding certain leadership positions on campus or receiving certain College-endorsed fellowships. Khurana was instrumental in crafting the policy—in the year leading up to its announcement, he met repeatedly with social group leaders behind closed doors to discuss the legislation. The penalties, unprecedented in Harvard’s history, drew national attention and faced vocal opposition from students, faculty, alumni, and outside observers in the year since their rollout. Eighty-one percent of senior respondents who said they viewed Khurana unfavorably also indicated they did not support the College’s policy. By contrast, 51 percent of people who reported supporting Khurana also said they approve of the sanctions. Among graduating members of penalized social groups, 29 percent of respondents indicated holding a favorable view of Khurana, while 59 percent said they had an unfavorable view of him. Fifty-two percent of seniors who have never been members of these organizations said they have a favorable view of Khurana, while 29 percent of this group reported viewing Khurana unfavorably. The sanctions are still subject to change: a faculty committee Khurana unveiled in January could revise or replace the policy. The new body will share its preliminary recommendations with faculty members in “coming weeks,” and plans to present a final report in fall 2017. This year’s version of The Crimson’s survey, sent to every senior via email, was open from May 1 to May 12 and was anonymous. The Crimson did not adjust data collected for possible self-selection bias.